NOTE: This post was included in Classic Science Papers 2008 Challenge, which has posts about a classic paper across many disciplines. That list was expanded and became the first installment of a new science blogging carnival called “The Giant’s Shoulders”. See more about the carnival here and see the expanded first installment on A Blog Around The Clock here. Nature vibrates with rhythms, climatic and diastrophic, those finding stratigraphic expression ranging in period from rapid oscillation of surface waters, recorded in ripple-mark, to those long-deferred strirrings of the deep imprisoned titans which have divided earth history into periods and eras. Just as a note, the term ‘diastrophic’ is a no-longer-used term referring to the deformation of the Earth’s crust … so, in essence, Barrell is citing climate and tectonics as the two major forcings on sedimentation and stratigraphic patterns. I’ll come back to this later. Wikipedia => “The branch of geology that studies rock layers and layering (stratification)”. Those are fine, I suppose … but these are rather bland definitions that miss the essence in my opinion. Fundamentally, stratigraphy asks the question: how is time recorded in sedimentary rocks? When you look at a succession of sedimentary rocks you are looking at a record of the Earth’s surface through time. If you’re interested in paleobiology or Earth history, for example, understanding how the passage of time is recorded in those rocks is critical. Ideally we would use absolute dating techniques to date every single layer of sediment. Since we can’t do that yet (that’s a challenge to the geochronologists), we need to make inferences and interpretations about the passage of time from the characteristics of the rocks^. The deposition of nearly all sediments occurs just below the local baselevel, represented by wave base of river flood level, and is dependent on upward oscillations of baselevel or downward oscillations of the bottom, either of which makes room for sediments below baselevel. Note that Barrell attributes baselevel to a single geomorphic level — in this case, wave base of river flood (see first post for more on baselevel). You’ll also note the definition for what stratigraphers now term accommodation, which is simply the space available for sediment to accumulate. You’ll hear stratigraphers talk about systems with high or low accommodation, fluctuations in accommodation, and so on. One of the most intuitive, and thus oft-cited, examples of accommodation change is attributed to changes in sea level. When sea level goes up, for example, accommodation on the shelf increases. That is, there’s more room for marine sediments to accumulate. Changes in sea level have certainly had a huge impact on the stratigraphic record; however, I would caution against jumping to that conclusion in all cases. But that’s a topic for another day. So, Barrell discusses baselevel and accommodation, but the aspect of the paper I wanted to highlight for this post is his discussion of, as he puts it, the rhythms of geologic time as recorded in sedimentary rocks. As far as I know (please correct me if I’m wrong) Barrell was the first to explicitly discuss composite rhythms within the context of what’s preserved in the stratigraphic record. Nature pulsates with many rhythms, small and large, fast and slow. Their combination gives a varied curve which, if the rhythms are incommensurable in period, may never recur in quite the same combination. Even better, this is illustrated in the key figure from Barrell’s paper below (click on it for a bigger version). The vertical axis represents baselevel and the horizontal axis is time. Barrell is combining three curves of different wavelengths and amplitudes into one composite curve (by the way, if you’ve taken a stratigraphy or sequence stratigraphy class, this figure should look familiar; it has been reproduced many times over the years). The concept of composite curves, in general, was not new in 1917. But, Barrell applies it directly to processes of sedimentation and preservation. He shows a generic stratigraphic column on the left side of the figure. On the top of the image, he’s showing which time intervals are actually recorded by sediment accumulation (with the vertical black bars). Remember, this is a theoretical example in which sedimentation (and preservation of sediment) occurs during the times of maximum baselevel rise on the composite curve. Note how the black bars at the top are clustered (bounded by dashed lines) during the rising limb of the intermediate curve. And then each individual black bar is tied to the highest frequency curve. The idea of preservation on the rising limb of a baselevel curve was later tested quantitatively with numerous and broad-ranging modeling efforts (see Paola, 2000; Sedimentology, v. 47 for a great review of the history and types of modeling in stratigraphy research). Conceptually, this idea is still generally accepted in the stratigraphy community. The curve, to correspond to nature, should be imagined as less regular and with more orders of rhythm. In other words, each component curve would be much more erratic and there would be many more of them. More recent research has attempted to address this from interpretations from natural systems and results from modeling. If you’ve read this far, you might be wondering what the origins of these theoretical curves are. WHERE DOES THE RHYTHM COME FROM? Another method [of investigation] is that of the detection of rhythms in parts of the sedimentary series, and the correlation of these rhythms with known climatic cycles. He then talks about the climate cycles as a function of orbital precession and solar energy — Milankovitch cycles essentially. This is around the same time that Milanković, himself, published work related to these cycles. It might be interesting from a history of science perspective to try and track the development of the ideas within the context of who published what and when. Many small oscillations and some of even larger magnitude are, however, dependent upon climatic change. I’m not going to go into an exhaustive review of climate and sedimentation in this post. There are numerous papers and parts of textbooks that go into that topic in more detail#. 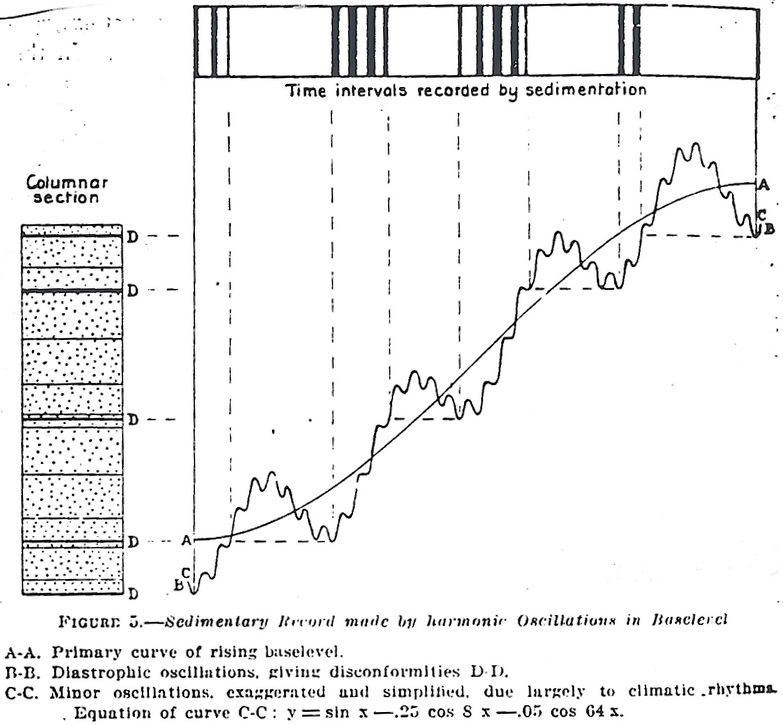 We still don’t have a good handle on how exactly climatic rhythms translate into stratigraphy. While there may be cases where physical patterns in sedimentary successions do “match” with temporal patterns of climate variability (e.g., varved sediments interpreted as product of Milankovitch cycles), most depositional environments likely have a complex suite of intermediary processes that result in a low signal-to-noise ratio, so to speak, as a result of varying types of processes and timescales. Investigating the relationship of process-response in sedimentary systems is still an active and vibrant area of research. One of the purposes of this post is to show that these ideas have been around for quite a while. It is fascinating to read a paper like Barrell’s because it can more clearly reveal the state of current research. If you’re interested in this field, I definitely recommend reading this paper for some important historical context. ^ Check out a great book about stratigraphy that is written in relatively non-technical language called The Nature of the Stratigraphical Record by Derek Ager. It is a fairly short read with a playful and quite enjoyable tone. # A text by Andrew Miall called The Geology of Stratigraphic Sequences is just one of many good references. Please comment below about others that you like. Does the paper consider the differences between accommodation limits on sedimentation and transport limits? Lab Lemming … I guess it depends on exactly what you mean. Maybe expand your question? Although the paper does not use the exact same terms as you have above, Barrell does discuss these differences (more or less). But, I’d have to look though it again with that specifically in mind. Great post. Old papers are fun to read (although this is another one that I have never read). Not only to see where the great ideas ultimately come from, but also to realize where some fuzzy concepts originate that in the end may prove to be confusing rather than helpful. It seems to me that the concept of ‘baselevel’ in stratigraphy belongs to the latter category: it is questionable whether a new term is needed to describe a “surface toward which external forces strive, the surface at which neither erosion nor sedimentation takes place”. Why should we talk about baselevel rise when we could simply say sea-level rise. It makes some sense to explain river incision as the result of baselevel drop (although even in this case baselevel is in fact sea- or lake level, so why introduce another layer of abstraction and terminology); but it is quite confusing to try to think about baselevel drops or rises in the deep sea: the bottom of the ocean moves pretty slowly in a vertical direction. I guess at the time Barrell was thinking about baselevel, very little was known about the deep sea, so he did not consider what happens to sediments once they somehow manage to get off the continental shelf. The concept of baselevel as first introduced by John Wesley Powell, which is what Barrell is addressing, is a horizontal global surface, which is, in many cases, sea level. Wheeler, however, turned it into a non-horizontal dynamic surface that is a description rather than a control. Perhaps it’s semantics or ‘splitting hairs’ but, to me, baselevel is more inclusive. Sea level is indeed a baselevel … but, as you point out, what about for nonmarine/fluvial or deep-marine? What about for the areas up- and down-system of sea level? In other words, calling sea level the ultimate baselevel no matter what is limiting. Now, maybe the whole concept of baselevel doesn’t apply for the deep marine … as you allude to. In more recent papers, the concept of an equilibrium profile (as a function of gradient, topography, and confinement conditions) might be the closest thing to the baselevel concept as was discussed nearly 100 years ago. And what about baselevel in large interior basins such as the Great Basin of the American west? Baselevel, as I understand the term, does change in these interior areas, not in response to sea-level changes (usually), sometimes in response to climate changes that lower major lake levels, sometimes in response to tectonic changes, and also, I think, in response to isostacy and playa deflation. Wasn’t baselevel also addressed by the father of geomorphology, William Morris Davis? Not sure about that, though. I think the quote about nature’s rhythms is very interesting, and I wonder if fractals somehow could fit in with some of these ideas? I’m also wondering if the repetitive or semi-repetitive beddding of some turbidite sequences – or maybe I’m thinking of varve-like sequences in general? – fit in with these ideas about rhythyms. Silver Fox, regarding origins of baselevel, my knowledge of the subject tracks it back to John Wesley Powell (read the a whole post about baselevel here). It’s a good point about Davis … I don’t know that part of the history, that was around same time as Powell, did they influence each other? Did one influence the other more strongly? I don’t know…would be worth learning about. But, yes interior basins that are not linked to sea level can certainly have their “own” baselevel. As for your questions about detecting rhythms in the rocks … it’s a very fascinating subject. There’s an entire field of ‘cyclostratigraphy’ that aims to do just that. Commonly, as you say, it is with varve-rich sequences or other sedimentary systems that are sensitive and more direct recorders of external forcings (typically, but not always, from quiet environments and chemical sedimentation). In terms of whether or turbidites can be used … well, I have a paper in review right now that documents a potential example of just that (I’ll post about it here once it’s in press). But, more generally, turbidite sequences are a lot “noisier”; that is, they are recording the frequency and magnitude of sedimentation events, but what’s controlling the occurrence of those events, and so on … the signal from the underlying external control is diminished (or completely destroyed) as a result of numerous intermediary steps along the source-to-sink pathway. In other words, turbidites have a low signal-to-noise ratio. All sedimentary systems have a variable degree of “noisiness”, so the goal is how to detect the real signal. Or, even more fundamentally, is the signal maintained at all? There has been some interesting work down in the last decade with physical experiments that suggest external forcings get so masked by all the inherent (and intrinsic) complexity of a sedimentary system that it’s often undetectable. I’ll stop myself before I go on forever … I hope that addresses your questions. The earth also behaves as a resonant cavity and the earth’s revolution is in harmony with Jupiter’s outer moon, Pasiphae, all of which suggests that rhythmic climate change could have an inner-outer spatial geometry. To an observer inside of this system, the curve of deposition or temperature as plotted against time, could not be interpreted in a ‘causal’ sense where the ‘present’ condition depended on the past. For example, in the case of a spherical ‘cosmic’ pressure wave, if the atmosphere were close to 100% humidity when the inner-outer wave was in higher pressure mode, the atmosphere would clear and the temperature would rise while when the inner-outer pressure wave was in lower pressure mode, the atmosphere would cloud and the temperature would drop. These ‘rhythmic’ effects would be symmetric relative to the present; i.e. we could not interpret the temperature-over-time curve in a causal sense. Such ‘resonant cavity’ effects, harmonically coupled across planetary space (not simply earth-based), have presumably been looked for and either found or not found. Meanwhile, they seem to be suggested by the Milanković cycles which, given ‘relativity’ would be ‘resonance’ based; i.e. the ‘base-level’ would involve dynamic balance in trans-planetary space, rather than being ‘local’. Thanks for this, a good little explanation. Another great book on Stratigraphy which would definitely come in useful for first year Geosciences students is “The Key to Earth History” by Doyle, Bennet and Baxter. It certainly helped me! Link to a PDF copy of the paper.